Jimmy Buffett's Margaritaville, a favorite Jamaican haunt, is located less than two kilometers from the hotel, as are casino and entertainment venues at Coral Cliff. Renovated in 2004, the resort offers contemporary-tropical ambience, with Mexican pottery and Indonesian influences such as wood-paddle ceiling fans, wicker-and-mahogany-toned furniture and an open-air, sea-view lobby. On-site restaurants include the open-air Passa Passa that prepares buffet selections. Souk provides sea views and dinner service, while the Beach Grill is a casual beachfront hangout that serves fast food. The hotel provides two lobby computers with high-speed Internet access. A restful pool and an activities pool with swim-up bar are bordered by cushioned teak lounge chairs. An outdoor spa tub accommodates 12 people. 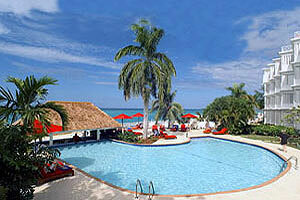 The resort supplies snorkeling gear, pedal boats, kayaks, windsurfers and Hobie Cat and Sunfish sailboats. An air-conditioned fitness center contains cardio machines, a universal gym and free weights.